Psst. My very good friend Andrew Atkins turned 50 in the fall of 2008 and it was an opportunity for me to surprise him on his birthday with the following DVD. During 2002-2003 we recorded some basic tracks of new material in my home studio that Andrew had composed. One thing lead to another and we never got the basic tracks finished so I took it upon myself to arrange with a mutual friend of ours, Patrick Aldous, to pull together some musical talent and the rest is history. 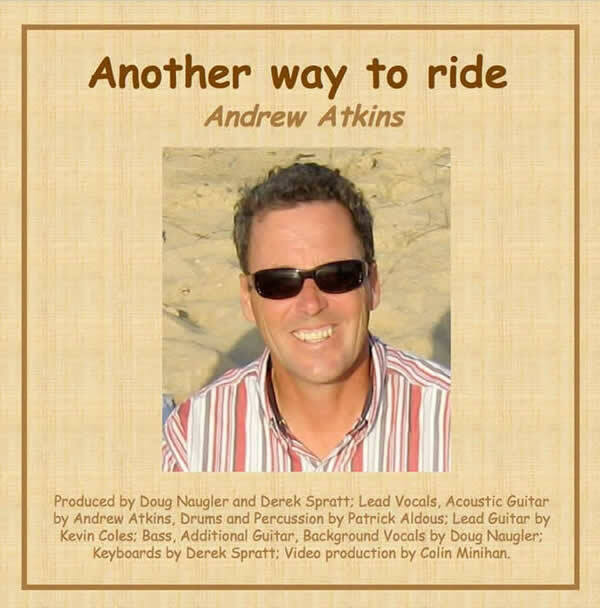 The track 'Another way to ride' was produced by Doug Naugler and Derek Spratt; Lead Vocals, Acoustic Guitar by Andrew Atkins, Drums and Percussion by Patrick Aldous; Lead Guitar by Kevin Coles; Bass, Additional Guitar, Background Vocals by Doug Naugler; Keyboards by Derek Spratt; Video production by Colin Minihan. This DVD was presented as a surprise gift to Andrew on the occasion of his 50th Birthday, September 20, 2008. It was originally recorded on March 13, 2003 in my home studio. Drums recorded at Mushroom Studios on September 14, 2008. All additional tracks recorded and mixed down at Greenhouse Studios on September 15-16, 2008.